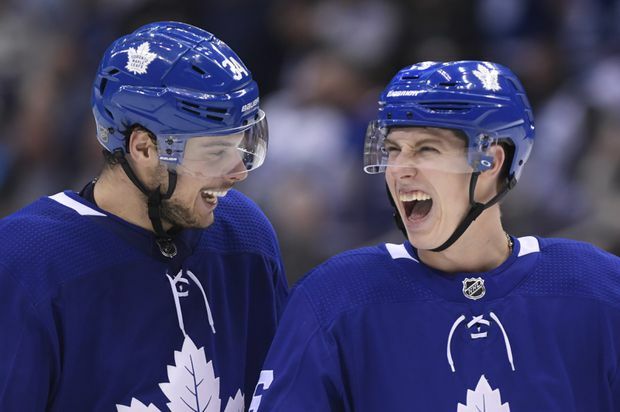 Toronto Maple Leafs right wing Mitch Marner and centre Auston Matthews laugh during a game against the Florida Panthers, in Toronto, on Dec. 20, 2018. At first, it looked like the power of social media finally swayed Mike Babcock. In the latest line shuffling by the Toronto Maple Leafs head coach in an effort to pull his team out of its lengthy swoon, there were Auston Matthews and Mitch Marner, together at last, with Patrick Marleau along to provide some veteran guidance at Monday’s practice. It was as if years of pleading on every form of social and mainstream media finally worked. Well gee, coach, what about all those fans who’ve been asking for this on Twitter since Matthews and Marner were rookies? Babcock fixed his questioner with an icy stare. “It doesn’t much matter to me,” he said. Actually, given the circumstances of the Leafs’ schedule this week, it appears their two most exciting players will be together at least for Wednesday’s home game against the Washington Capitals. Shortly after Monday’s practice, the Leafs announced that Tuesday will be a day off, which makes it unlikely Babcock will deviate from the last lines he used. Kasperi Kapanen took Marner’s spot at right wing beside John Tavares while Zach Hyman moved back to the left side on that line. Third-line centre Nazem Kadri played between Connor Brown and William Nylander while the fourth line was made up of centre Frédérik Gauthier, left winger Par Lindholm and spare defenceman Justin Holl. Holl was filling a roster hole left by Andreas Johnsson, who suffered a concussion in Sunday’s loss to the Arizona Coyotes. Forward Trevor Moore is expected to be called up from the Toronto Marlies farm team for the Capitals game. Also missing from practice was defenceman Jake Gardiner, who is dealing with back spasms. Babcock said Gardiner will play Wednesday if he can. Putting Matthews and Marner together was simply an attempt to jump-start the offence on a team that has lost seven of its last 10 NHL games. Babcock does not shuffle his lines constantly like some of his peers, but has been doing it often lately as the Leafs remain stuck in neutral. Other than the power play and a few stints in five-on-five play that never lasted, Marner and Matthews have not played regularly together since they came to the Leafs in 2016. But the prospect of Marner, the Leafs’ points leader with 61 in 48 games, working his playmaking magic with Matthews, an elite scorer, has long tantalized the fans and media despite Babcock’s stubborn refusal to try it. But what may have changed the coach’s mind is Matthews’s prolonged scoring drought. This has not received the attention it normally might because of the worse scoring plight of Nylander and a few high-profile defensive mistakes by Gardiner. However, Matthews has just one goal in his past 13 games although he does have nine points in that stretch. The goal came back on Jan. 5, and his scoreless streak is now at seven games. Both players, who room together on the road, are looking forward to the experiment. How long it lasts is up in the air as the Leafs will head into their combined all-star and five-day breaks following the Capitals game. They will not play again until Feb. 1 when they meet the Detroit Red Wings. Marner said all the time spent hanging around with Matthews on the road may help when it comes to knowing his buddy on the ice, but he’s well aware how they need to play together. Something else the Leafs need to get going is their power play. It fell apart shortly before Christmas despite all of the talent on it, in large part because opponents realized the key was preventing Marner from setting up Matthews on the left side for a one-timer. Teams also figured out the unit couldn’t run wild if it wasn’t given any chances. Since Dec. 22, the Leafs have had more than two power plays in just two games and have gone two-for-24. Another reason the Leafs are not getting more power plays is they simply are not playing well enough. “When you’re playing with the puck and making the team have to defend you it gives you a much better opportunity to draw penalties and be hard to play against,” Tavares said. “At times we haven’t got some calls. Sometimes things don’t always go your way.